Are your event reports just vanity metrics? For many companies, reporting on event performance is a real challenge, a symptom of the disconnect between the tools used to collect leads at events and the rest of your sales and marketing toolkit. But even the companies that do produce event reports aren’t necessarily reporting on the right things. Today we’re looking at the most common event vanity metrics, and what to report on instead. Lots of businesses use events as a branding activity, as well as an opportunity to generate new business leads. This normally means their attendance at the event is accompanied by a flurry of social media activity, designed to get their brand in front of a wider audience. While it’s always nice to see a spike in social shares and social media mentions, these are unlikely to deliver return on investment, so have no place in your events report. If you’re reporting on the number of badges scanned during an event, all you’re reporting on is how many people your sales team spoke to, or how busy they were. It doesn’t give any insight to the quality of conversations or whether you’ve got any genuine new sales opportunities – just how quick your team are with a badge scanner. This number is more useful to report on than number of badges scanned, but unfortunately many companies collect contacts, not leads. While this number can help you quantify how busy the event was and how many people your sales team spoke to, if you’re just getting lists of contacts without additional qualifying context, then this gives no indication of how this event will drive revenue and deliver return on investment. The number of pre-registered visitors doesn’t align with the number of people through the door. If you’re hosting your own event, or running a seminar that requires pre-registration, reporting on event registrations can help you get an indication of expected numbers, but shouldn’t be shared as ‘proof’ of success. Additionally, you should always expect to see a significant number of no-shows – along with a number of walk-ins, so numbers on the day will differ significantly from your pre-registration numbers. For example, one of our customers tracks the number of sales qualified leads (SQLs) generated as their key metric to measure their events. This helps you understand the value of the event in terms of potential sales opportunities: a poor-fit event will likely deliver fewer sales qualified leads than one that’s closely aligned with your business offering. But only if they’re real leads, not contacts (see above for why you shouldn’t measure this). 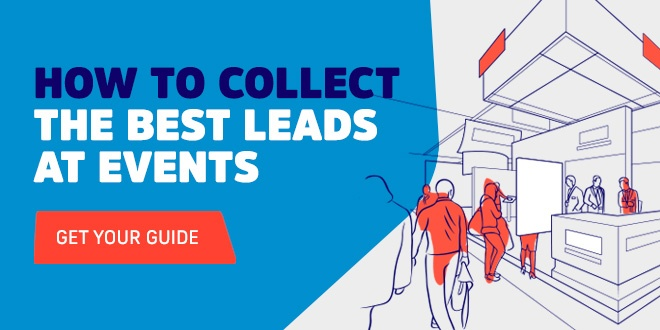 Number of leads is still a bit of a vanity metric, but it can be useful for benchmarking how successful an event has been, right after it closes – as long as you can get hold of that data quickly, and are able to compare it against the other events in your calendar. You won’t be able to track this immediately after the event, but it’s definitely worth tracking in the long term. This may mean you need to revisit your event numbers, leads and sales after several months – which is easily forgotten, but so worthwhile. Being able to report on revenue from the event (even if an event was only a single touchpoint during the sales process) will help you understand how events drive revenue for your business. And this in turn will help you make crucial decisions as to which events are worth exhibiting at next time around. By tracking event metrics, you’ll be able to make real, informed decisions about which events are worth investing in, and which don’t deliver value to your business. But don’t get caught out by vanity metrics; measure what matters to understand the real value of your events program for generating new business leads.